Rainshow'r Green Knight Dechlorinator - Only $69.99! What are the differences between the GardenGro and GreenKnight? Both the GardenGro and the Green Knight utilize KDF55 and energized crystal. The GardenGro has replaceable cartridge filter and the GreenKnight is a disposable filter. 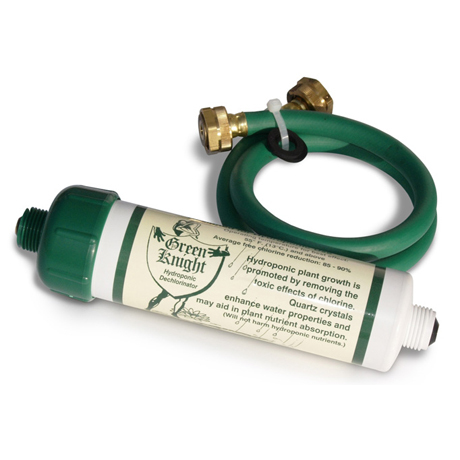 The GardenGro lasts 20,000 gallons and the GreenKnight lasts 30,000 gallons. The GreenKnight includes a built in polyester prefilter for increased performance and efficiency. The PFGG prefilter is compatible with both models.